Martinique is a rugged Caribbean island that’s part of the Lesser Antilles. An overseas region of France, its culture reflects a distinctive blend of French and West Indian influences. 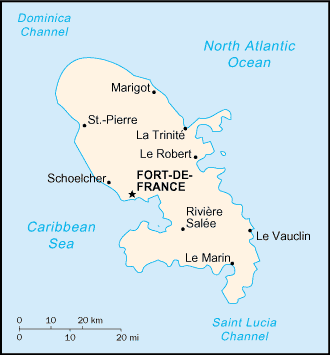 Its largest town, Fort-de-France, features steep hills, narrow streets and La Savane, a garden bordered by shops and cafes. In the garden is a statue of island native Joséphine de Beauharnais, first wife of Napoleon Bonaparte. Volcanic in origin, Martinique is a mountainous stunner crowned by the still-smoldering Mont Pelée, the volcano that wiped out the former capital of St-Pierre in 1902. Offering a striking diversity of landscapes and atmospheres, Martinique is a cosmopolitan and sophisticated island that boasts stunning beaches, superb hiking, top-notch culinary experiences, an enormous array of activities and rich cultural life. The rainforested, mountainous northern part is the most spectacular, but the south has its fair share of natural wonders, including lovely bays and miles of gorgeous beaches. Add to this a dash of Gallic joie de vivre and you’ll understand why so many people love Martinique.